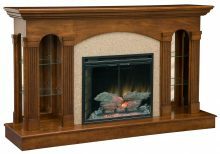 Stay warm this winter with one of our Amish electric fireplace units. Amish electric fireplaces give you the look and feel of traditional wood-burning fireplaces while providing greater convenience and safety. 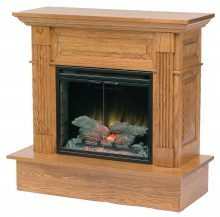 And like every piece of furniture available from AmishOutletStore.com, our electric fireplaces feature the expert craftsmanship and painstaking attention to detail that has exemplified Amish furniture-making for centuries. 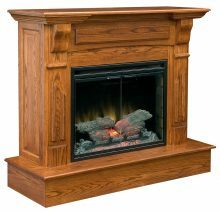 Our Amish electric fireplaces feature solid wood construction designed to stand the test of time. Most fireplaces offer the choice of oak, cherry or QS white oak, woods that are known for their excellent durability as well as their unmistakable beauty. The large selection of gorgeous oak stains allows you to choose the finish that is most appropriate for your rooms unique décor. 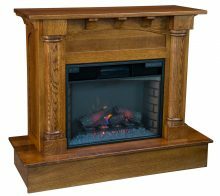 How Do I Choose the Right Solid Wood Amish Fireplace? Houses come in a wide range of styles, and so do our fireplaces. We make them in different colors, sizes and designs so you can find one to fit the personality and unique décor of your house. Color. If you have white walls and light floors, a darker fireplace, such as the Curio Fireplace or Delgado Entertainment Fireplace, will stand out brilliantly. However, if your color scheme is dark and you have chestnut floors, you will want a lighter option to brighten the room, such as the Horizons Entertainment Fireplace. Style. All of our Amish fireplaces have been designed to suit different looks. For instance, if you’re getting a fireplace for your log cabin, a rustic style such as the Rock Ledge Fireplace could fit perfectly, though the Modesto Fireplace with Mantle Lift would look better in a modern house. Size. Many people don’t realize Amish electric fireplaces come in different sizes. Your choice will depend on the size of the room you’ll be putting it in. Smaller options include the Mission Fireplace in Oak and Charleston Fireplace. What Room Does an Electric Fireplace Look Best In? There is no single answer to this question. The answer depends entirely on your taste and the layout of your house. Most people put their new fireplaces in their living rooms. They enjoy gathering around them on cold days and spending family time catching up while they get warm. Amish fireplaces made of solid wood can also dress up a bedroom or add unexpected flare to a dining room. Basements, which tend to be chilly, also house our Amish fireplaces in a great number of homes. Should My New Furniture Match My Fireplace? Ideally, yes, but it doesn’t need to at first. Once you’ve fallen in love with one of our Amish fireplaces, you may take it home with no intention of matching your current furniture. But after a time, you’ll notice the other furniture doesn’t look quite right anymore. 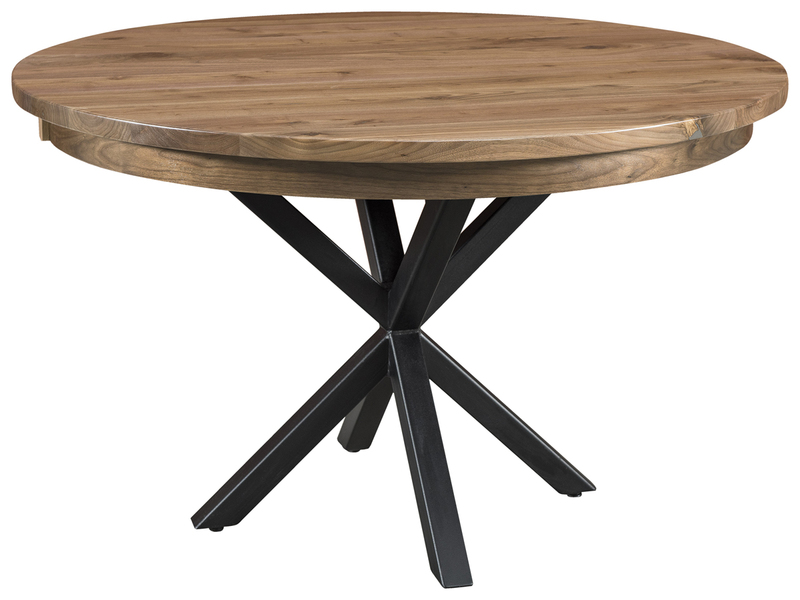 You can use short-term solutions such as covering mismatched wood grains with tablecloths or sheets. Eventually, though, you’ll want to match the grain in your new fireplace. Luckily, you can shop for matching furniture sets with us, making the process much less of a hassle. How Does an Amish Electric Fireplace Work? Our electric fireplaces plug into the wall and can be hooked up to switches for an easy on and off. They generate heat through metal coils. We use an Electric Dimplex Flame Unit in most of our fireplaces, and they pump out a surprising amount of heat for their size. You can also turn many of our models on and off with a remote control. Electric fireplaces are easy to work. The upkeep is minimal, and you will likely find yourself flipping them on when there’s the least little nip in the air. 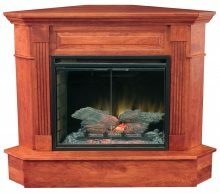 Explore Our Exclusive Amish Electric Fireplace Line! Choose from our exclusive line, including the Charleston Corner Fireplace, Covington Fireplace, Mission Fireplace, Modesto Fireplace, Regal Corner Fireplace, Modesto Corner Fireplace and Valley Fireplace. With so many options available to choose from, youre sure to find a fireplace that is ideally suited for your home and lifestyle. Once you add an Amish electric fireplace to your home, youll understand why homeowners everywhere have been making Amish furniture a cornerstone of their home décor for generations. 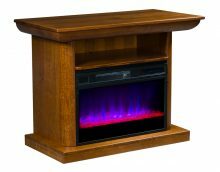 An Amish electric fireplace from AmishOutletStore.com is the stylish way to stay warm for many winters to come!